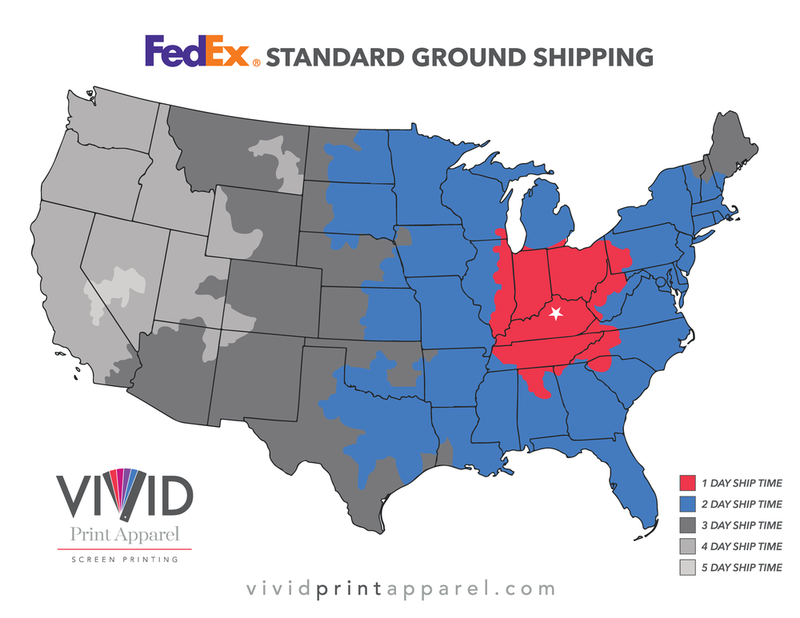 Q: Who is Vivid Print Apparel? Our goal is simple: provide our customers with the highest level of quality and service. We love printing t-shirts and other apparel in our state-of-the-art printing facility using the most efficient equipment available today! Our owners have 30 years of experience in production, sales, and customer satisfaction. Our talented team has been recruited from across the nation and is the best at what they do. Our in-house art and design studio can create custom art for your clients and communicate effortlessly with your art department on projects. We use UPS, FedEx, and can accommodate your freight shipping needs as well . We can ship using your account or our account, your choice. If you would like to use our shipping accounts please call in advance to request a rate quote. The maps below highlight 2-day ship times via Standard Ground Shipping from our home office in Lexington, KY (Click to Enlarge). Our typical turnaround time is 5 business days after you have provided us your final approval on the artwork and we have received the blank apparel. If you're in a hurry, we will definitely do our best to accommodate you. Contact us for rush delivery, and we will fire up presses and the coffee maker! Q: Do you use Blind Shipping? Yes. Just let us know and we will ship your order blind. Your client will receive their order as if it came from your address. Q: What are your packaging options? Q: Can I send you my own blank shirts for my order? Yes! We prefer that you send blank shirts to us for your order. If you would like for us to purchase shirts for your order please let us know and we can quote you a price. Q: What is the maximum image size that you can print? The maximum image that we can print on your order is 15" x 17". Q: What is your screen fee? Our standard screen fee is $15 per screen. We show you our screen fees separately to promote transparency in our pricing. We encourage you to compare our total costs versus other screen printers that may not show screen fees as a separate line item. Q: What is your ink change fee? Our standard ink change fee is $10 per color. Many more, just ask us. Q: What types of apparel and materials are available? We can print on any of your garments that you provide with your order. If you need to order garments, we can provide just about anything that is available and the materials range from basic cotton tee's, tri-blend fashion fit hoodies, and anything in between. We can send you an electronic catalog or mail you a physical catalog. Q: Will my order be exact and what is spoilage? Spoilage is the expectation that a portion of your order will be misprinted. Does this happen on every order? No, but you should be prepared if that event does happen. Simply include extra garments for us to print. We do our best to print every shirt perfectly but there can be errors. We take pride to keep our spoilage rate under 2% which is below the industry standard of 3%. If your order cannot tolerate a 2% spoilage rate please order extras garments (or provide us with extras blank garments, if you are providing the garments) with your order up to 2% extra with a one garment minimum. Q: What file formats do you need for my artwork? We prefer .eps, .ai, and .psd files. If your artwork is not in any of those formats, send it to us anyway and we will let you know what needs to be done. Regardless of your file type, it won't prevent us in finding a way to make it work. Contact us using our toll-free phone number: 1 (844) 23-SHIRT (7-4478). Get in touch with one of our Salespeople. Click the EMAIL US button below to send us an email and we will get in touch as soon as we can.